Tandem inflatable kayak featuring Hobie's Mirage Drive. 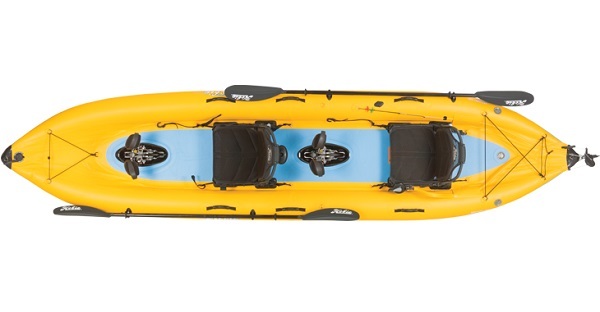 The i14t is ideal for those looking for kayak that is easy to transport and store. 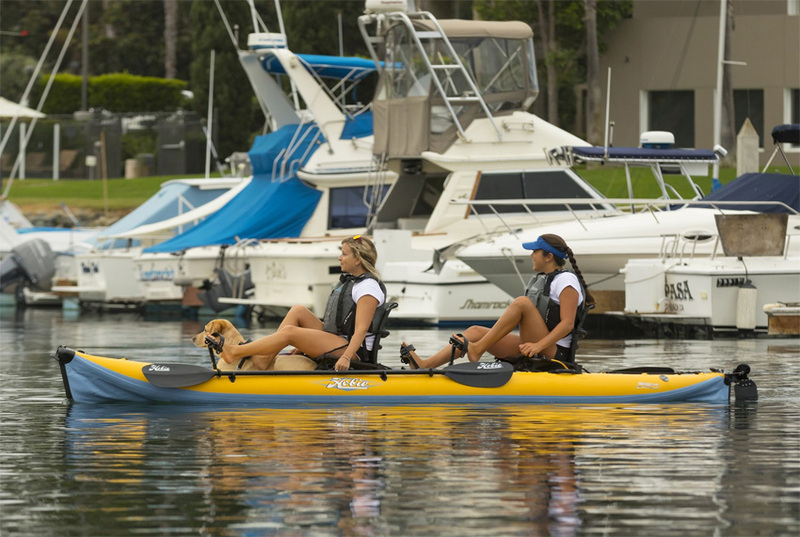 The Hobie I14t is a tandem kayak that you can take anywhere. It inflates easily and fast with its supplied pump and also deflates quickly for convenient storage. The kayak packs up into a wheeled carry bag making the trip from the car to the water's edge that much easier. The I14t features Hobie's MirageDrive system with pedals for both passengers but can also be used as a solo kayak as well. Fully Adjustable seat with breathable mesh. The Vatange seat can even be removed and used sa a beach chair. Hobie's come with a Twist & Stow Rudder that is easily controllable with a lever to steer as well as two pull handles on either side of the kayak: a "Down" handle to deploy the rudder and an "Up" handle to lift the rudder out of the water when in shallow water and for landing. 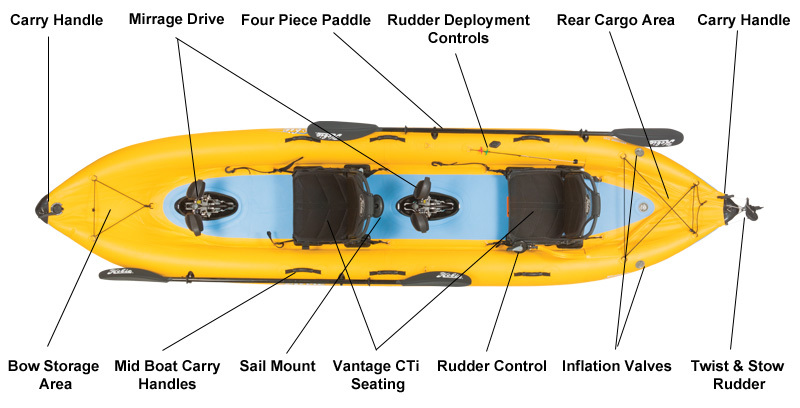 Drop stitch flooring allows for the construction of an inflatable kayak with greater inflation pressures. Hobie inflatable's fold up easily and pack away in to the included for convenient transportation and storage. 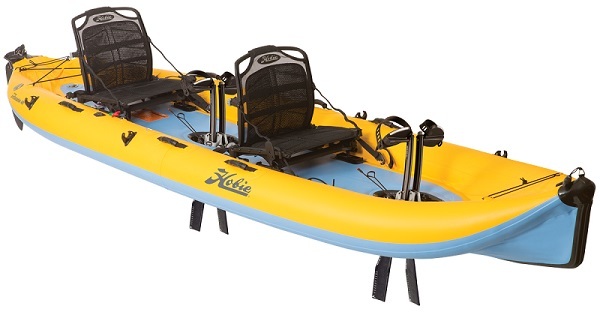 Hobie's come complete with a four piece paddle that can be used for additional manoeuvrability or for when you are not peddling. When not in use the paddle can be stored in the handy hull paddle holder. Storage space at the front of the boat. Upgrade your Hobie and add some sail power with the Hobie Sail Kit. A retractable tether for keeping your gear and equipment safe on board your kayak. We offer a delivery service for the Hobie i14t throughout the UK & Ireland to home and work addresses. If you are local to our shop in Hamworthy, Poole then we may be able to deliver a Hobie i14t with one of our own vehicles. For boats, this is free to most BH Postcodes - please call us on 01202 625256 to discuss your requirements. Buy a Hobie i14t online from our website and collect from our shop in Hamworthy, Poole or you can collect from any branch within the Canoe Shops Group. There is no cost associated with instore collection.